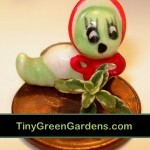 Welcome to Tiny Green Gardens! 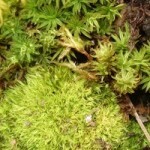 I've always been fascinated by tiny things and plants are no exception. The recent revival of interest in miniature gardens and terrariums have led to the highly popular concept of fairy gardening. I invite you to join me on my tiny gardening endeavors and I'll share with you my successes and hopefully, not too many failures. 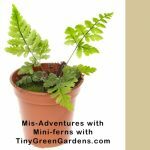 Along the way, I'll also share some of my favorite tiny green gardening decorations, accessories and plants; many of which can be found online. Tim and Gerty, my little frog and worm mascots, say hello. They will be along for the ride and are excited about being a part of this site and can't wait to meet the fairies who will be visiting our tiny green gardens. 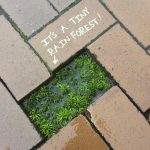 Today’s post a free smile from a fun bit of street grafiti – a tiny rain forest. 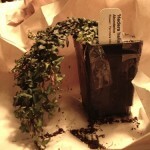 All it took was the question, “What is the plant in that picture?” and off I went to find out. It appears to be a frosted fern. 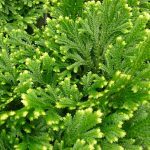 While not truly a fern, it is a most interesting plant. 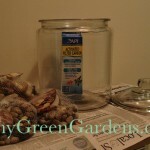 Learn about caring for one and where to buy a frosted fern. For me, the ultimate fairy garden is one with ferns and moss. Unfortunately, I am finding they are two of the fussiest things to keep alive, indoors. 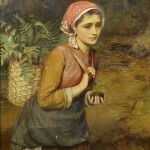 Do you love ferns? 19th Century Britons were manic about them. 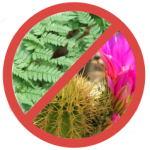 Pteridomania ruled and ferns became status symbols and highly collectable. 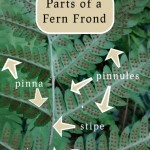 A brief primer about fern plants, the different parts of fern plants and other cool things you might not have known about ferns.